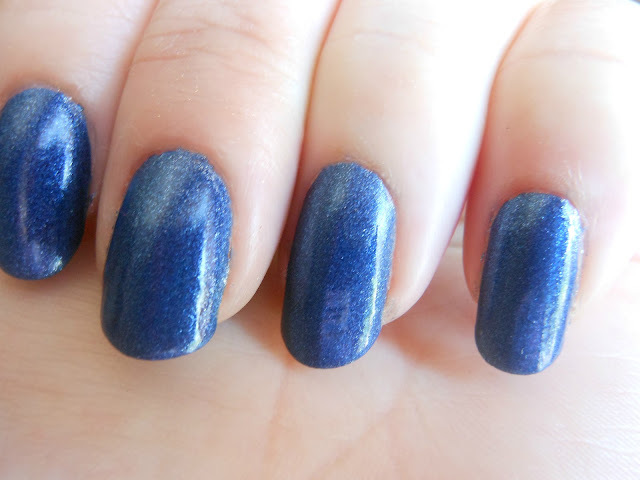 Today I have a peep at Barry M's new Nail Paint offering, Denim. It's a bright, royal blue richly infused with silver micro shimmer. Gorgeous in the natural sunlight, this blue boy will set you back €4.79 from Boots but they very often have specials so unless you're gagging to pick it up, I'd hold off for a deal. I'm especially impressed with the pigmentation of this new line (which also includes Copper, Silvery Lilac & Teal). Complete opacity can be reached with just one coat, which is a rarity in the polish world. Denim dries semi matte, so if high shine is your preference, you're going to need a top coat. And now for the bad news, while this didn't chip outright, there was tip wear on the second day with this polish, even with a Seche Vite top coat. I don't mind so much with lighter colours but with this blue, it's immediately obvious and just made my nails seem a little tatty. Boooo. While it's not one for longevity, I'm still loving the colour and formulation. For a night out or to match an outfit (possibly denim), I'd say Denim is a winner. Have you picked up anything from the new Barry M line as yet? you make a great detective Miss Cherry :D Thanks!